McCarthy & Stone has been helping people enjoy rich and fulfilling lifestyles throughout their retirement for more than four decades. It builds beautiful and intelligently designed homes in prime locations, nationwide. Every detail is carefully thought out: from access to local amenities to the internal layout and high-quality fixtures of each apartment. With three types of development on offer from this award-winning house-builder, all you need to decide is where you would like to live. Start your search today - or call 0800 201 4453. Enjoying the perfect home and lifestyle in our retirement is a widely shared aspiration. Some people long for a coastal retreat; for others a luxury apartment in a thriving market town ticks all the right boxes. You might crave the peace of rural life, or the hustle and bustle of city-centre living. Whatever your dreams, Lifestyle Living is about breathing life into them with age-exclusive developments in some of the country’s most enviable locations. Designed to increase space and light, each apartment is built to high specifications with a contemporary feel. Aimed at over-55s, developments sit in beautifully landscaped and fully maintained grounds. Enhanced security features mean you can lock up and leave at a moment’s notice – if you’re off on holiday, say – confident that your home and its contents are safe and secure. 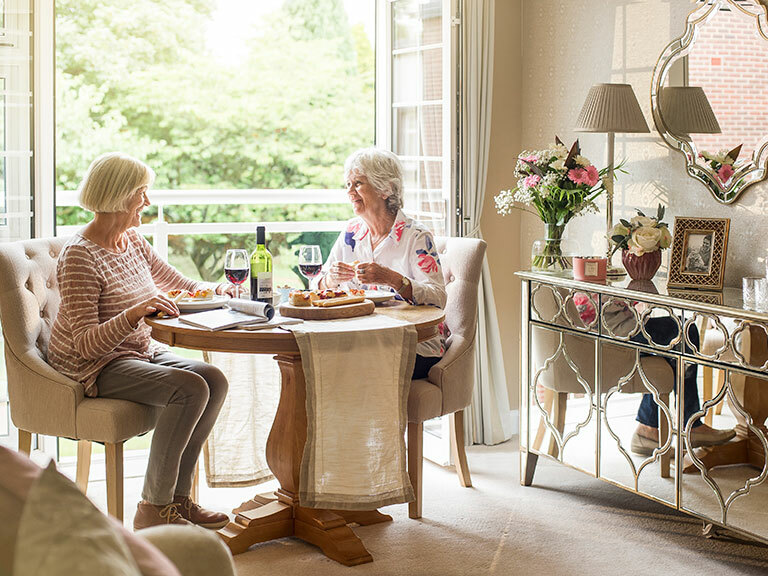 Embracing retirement means finding ways to focus more of your time and energy on enjoying the lifestyle you worked so hard to achieve.That’s the ethos behind Retirement Living, where you have the privacy of your own stunning apartment with the option to share luxurious social amenities with like-minded neighbours. A house manager ensures all external maintenance is taken care of and coordinates optional social events and activities. A secure camera-entry system means your property is safe, whether you’re there or not. Specifically for over-60s, design features include ovens and plug sockets at waist height, and non-slip flooring in the bathroom. Plus you can enjoy the peace of mind that comes from having access to a 24-hour emergency call centre, should you ever need it. Luxury living, with extra care and support you only pay for if needed, defines Retirement Living PLUS. You enjoy the independence of your own apartment, with qualified support on hand day and night, and flexible care packages. Exclusively for over-70s, each thoughtfully designed home boasts quality features for your needs now and in the future, with no compromise on style. Everything is positioned at just the right height to avoid unnecessary bending, while handrails can be fitted as required. These also feature throughout the shared areas. Landscaped gardens and light and airy lounges are great for socialising with neighbours as well as entertaining family and friends. Chefs at the onsite restaurant or bistro take great pride in knowing homeowners’ personal tastes. Many developments provide guest suites for overnight visitors (also available in Retirement Living). When Jean Ryder asked her best friends, Cecilia and Jim Smith, to join her on a speculative visit to Grove Court they were so impressed with what they saw they decided to buy an apartment too. Marie Bird loves to socialise. If she isn’t entertaining family and friends in her apartment at Bilberry Place, she can often be found chatting with her neighbours in the homeowners’ lounge. ‘Of course, if I want some quiet time alone I can have that too in the privacy of my beautiful home,’ she points out. ‘I always shut my front door feeling so safe and secure. Marie also enjoys keeping fit, joining several neighbours for the twice-weekly Pilates classes held at the development. Discover more about McCarthy & Stone's unique age-exclusive retirement options or call 0800 201 4453 for more information. Why choose a retirement village?